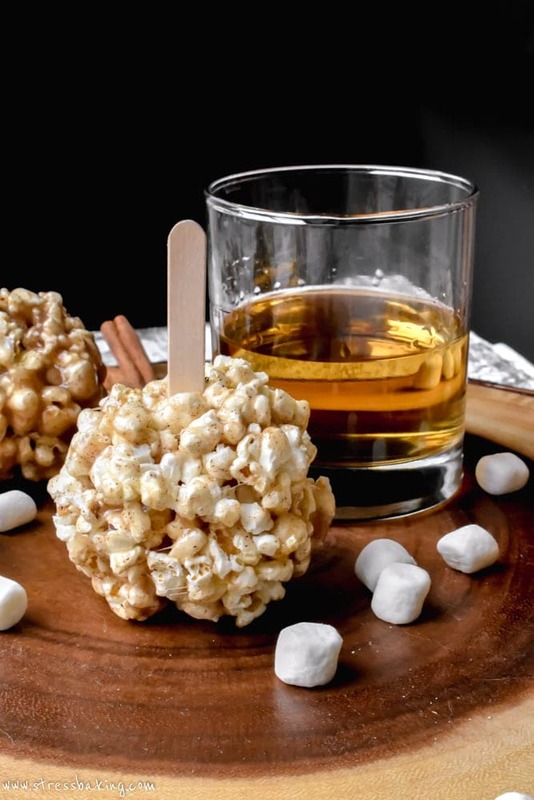 An adult version of the classic popcorn ball, featuring the addition of cinnamon and rum for a buttery, boozy, chewy Halloween treat! Children: Overpriced costumes and costume contests where they win McDonalds gift certificates. Adults: Inappropriate costumes and costume contests where they win booze. Adult: Chasing after hyper children that run around like lunatics until their sugar crash. Children: The Addams Family, Hocus Pocus, and It’s the Great Pumpkin, Charlie Brown. Adults: Well… same. Plus a bunch of gruesome, bloody horror movies. Depending on the year and day of the week on which Halloween falls, I swing one of two ways: I’m either the person that buys a crapload of candy and leaves the light on for trick or treaters, or turns off all the lights and watches horror movies in a pitch black house with a gigantic bowl of popcorn. This is our first Halloween in the new house, so we need to decide which couple we’re going to be. … TBD on that one. 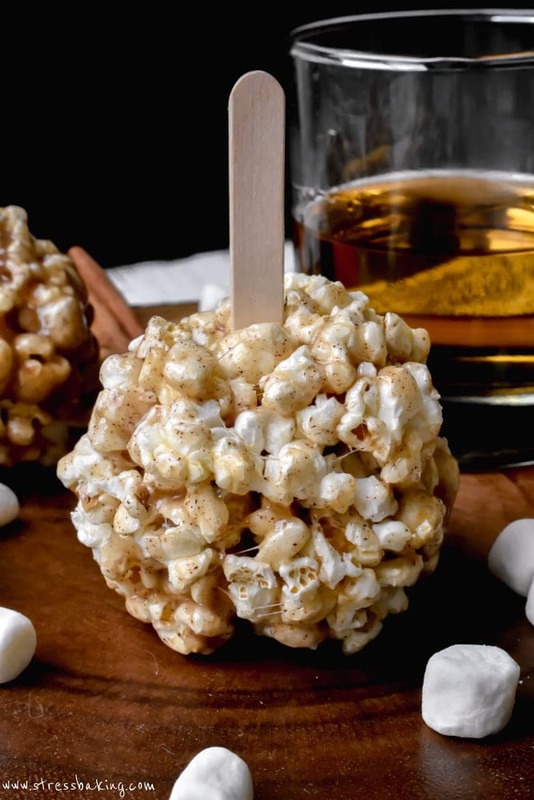 While we contemplate that, I’m going to make these cinnamon buttered rum popcorn balls on repeat. 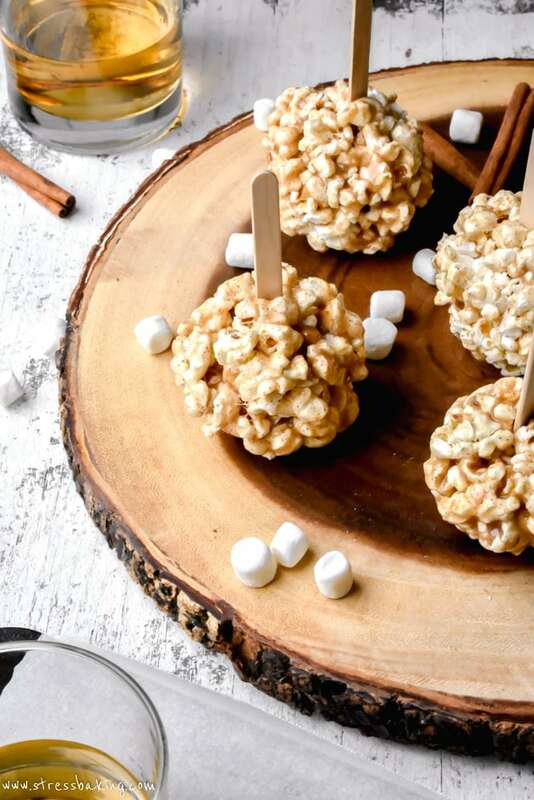 If you’re old enough to remember the days when kids rode their bikes without helmets and their curfews were determined by when the street lights turned on, you might also remember when people could hand out homemade candy apples and popcorn balls to trick or treaters. This was before we were terrified that all the candy was full of razor blades and that everyone was out to kill us. I’m gonna go ahead and make myself sound old and just say… I miss the good old days. I get why we go to great lengths to keep kids safe, and I don’t blame anyone for inspecting what they eat, where they get it, and limiting how much they can have. You’re all saints. Soooooo while you’re taking all the precautions to keep our kiddos safe, I’m going to make you some tasty adult treats to fuel your efforts. The best part? They’re not even hard to make! 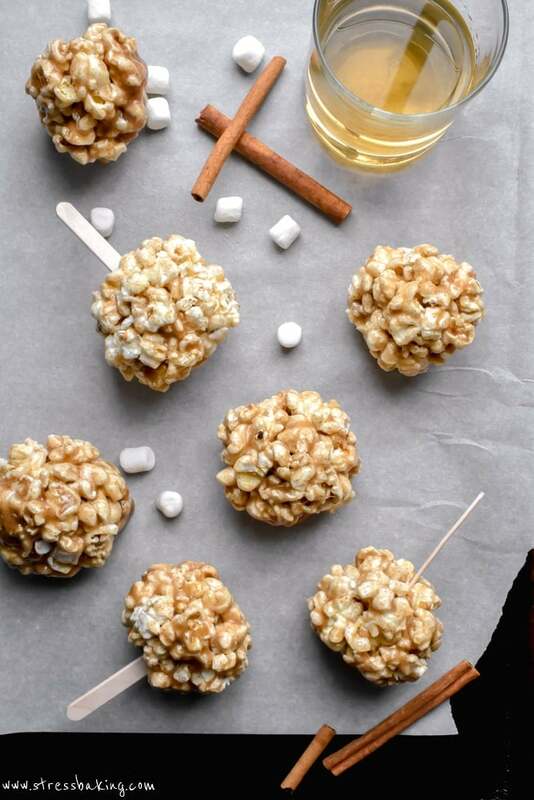 Take your classic popcorn balls, and add a little cinnamon and a little rum. They don’t taste like a shot of alcohol, but they do taste like a perfectly cinnamony sugary chewy treat. You could easily omit the rum if you wanted to, but what’s the fun in that? Prepare a baking sheet with parchment paper or a silicon mat and set aside. 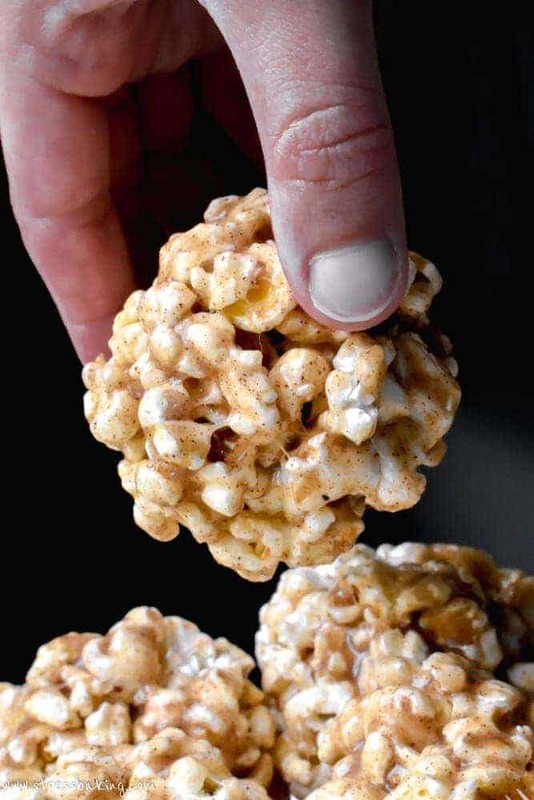 Using your preferred method, pop your popcorn and set aside in a large bowl. Pro tip: If you need to, you can even use a bag of microwave popcorn, popped according to package directions. If you use this method, omit the pinch of salt. In a medium saucepan, combine sugar, butter and corn syrup. Stir constantly over low heat until butter is melted and combined. Add marshmallows and stir constantly until melted and combined. Remove from heat and add cinnamon and rum (and salt, if adding). Stir to combine. 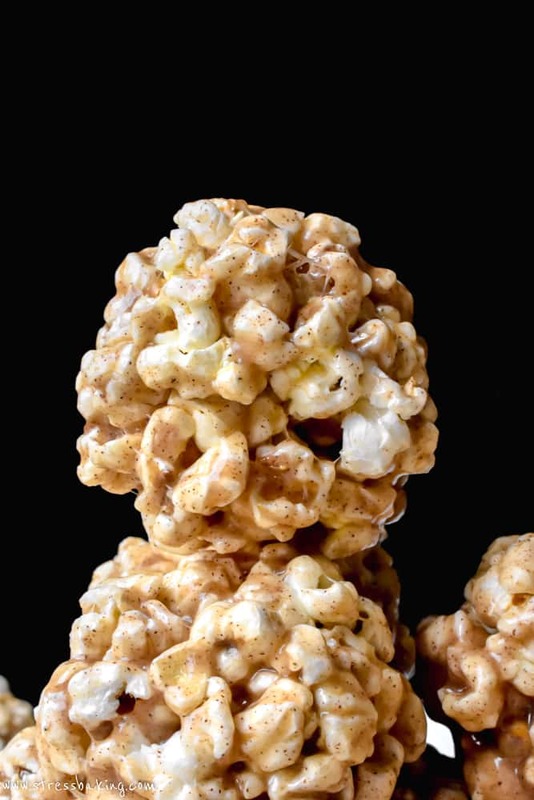 Pour mixture over popcorn and use a spatula to stir and coat. Spray your hands with nonstick spray and form balls 3 to 4″ in diameter. Place each ball on prepared baking sheet to set. If you desire, stick a popsicle stick in the top of each ball, pushing it about halfway in. Let set completely, serve, and enjoy!